Glass is a versatile medium that finds multiple uses in not only exteriors of a building, but also as a decorative element in home interiors. Industrial grade or architectural glass is used in structural placements such as flooring, ceiling and walls, whereas factory made artifacts are extensively incorporated into functional spaces in the form of screens, decorative window panels, murals and furniture. The ability of glass to allow light to pass through making it appear transparent or translucent is a property which makes it so desirable and versatile. 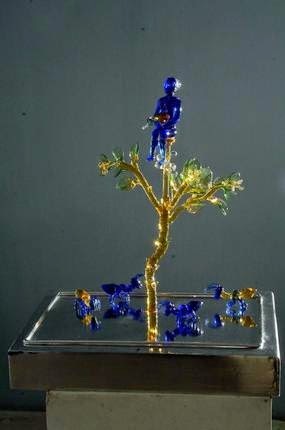 Glass is also popular as a medium to extend ones creativity and use it artistically. Stained glass, reverse painting on glass, blown, fused and molten glass are just some of the techniques and forms in which glass is manipulated to enhance its look and produce stunning art. Integrating glass in interiors allows one to experiment with space and light. The manner in which light interacts with glass creating striking effects is what makes this medium so special. The effect is highly dramatic when colours, textures and patterns are highlighted when light passes through it. When digital images, various pigments and at times other materials/media are embedded in the glass the outcome can be spectacular. The vibrancy of pigments as visible on the surface of the glass makes it interesting to display paintings on walls, as well. At times glass is substituted with acrylic sheets with similar results. The lighting here should be appropriate to maximize the effect and to accentuate the vibrancy of multiple colours. Unusual three dimensional forms in glass when incorporated in residential or commercial premises can be equally awe-inspiring. Large sculptures with different textures and colours create a great visual effect and must be placed in such a way to allow natural or artificial light to pass through to bring out the finer nuances and details embedded in the glass. Murals, sculptures and installations made of only glass or as a dominant component and mixed with other media can easily become the focal point of the décor. Studio glass, which is essentially limited edition glass products produced by an artist, is a popular form of art that makes wonderful accent pieces. For instance, hand painted light fixtures on walls and table lampshades will beautifully light up the space. Most glass artifacts are best displayed in a minimal environment to allow its beauty to come through. Although, stained or coloured glass can also be displayed in traditional settings. Lighting is one of the most important criteria for displaying glass art. An ill-lit corner or wall will completely ruin the effect of a work with glass. This article was published in The Times of India-The Address recently. Images of lampshades and interiors courtesy Bharati Sagar.